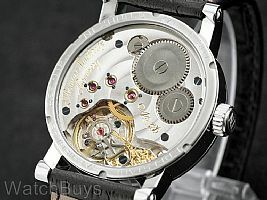 Most Thomas Ninchritz watches feature a second hand at 6, but the Philipp moves this function to 9. The dial and the hands are also noticeably different than his other watches. You'll notice that the hands and markers are silver in color and use a straight baton design, resulting in a very clean and crisp look. Case is in stainless steel and is polished by hand. Black calf leather strap which is attached by screws and features an engraved tang buckle. 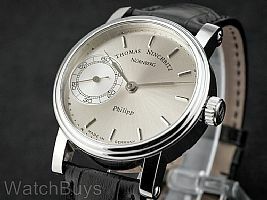 The Thomas Ninchritz Philipp is a watch that goes everywhere with anything.